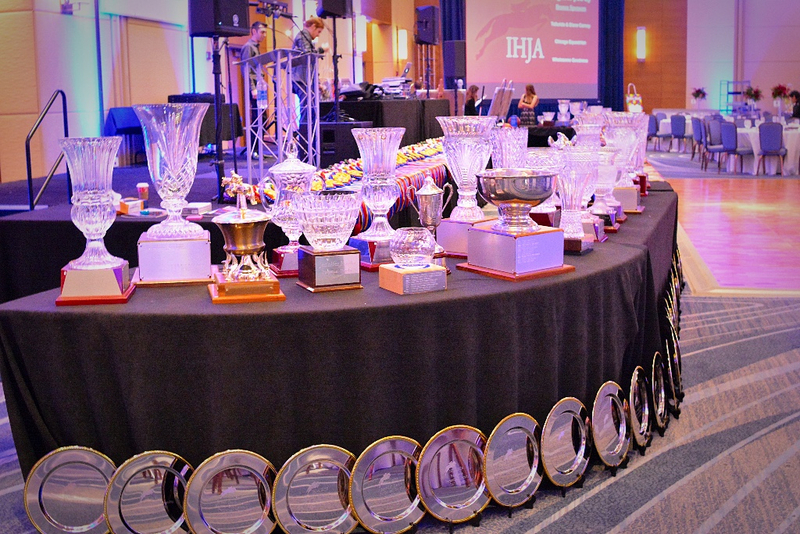 Over 900 ribbons are handed out at the IHJA Awards Gala to honor the top winners. Photo Chicago Equestrian. 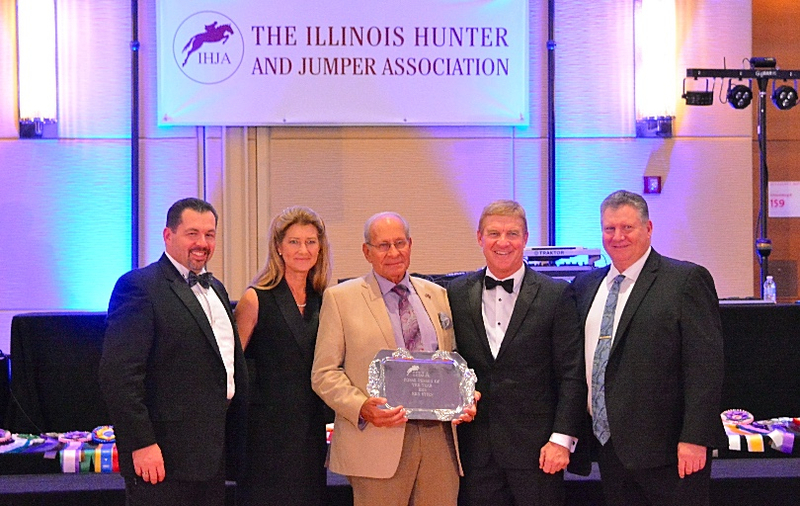 Schaumburg, IL - November 12, 2016 – The Illinois Hunter Jumper Association (IHJA) hosted the 2016 IHJA Awards Gala, Saturday November 12, 2016 at the Renaissance Hotel and Conference Center in Schaumburg, Illinois. 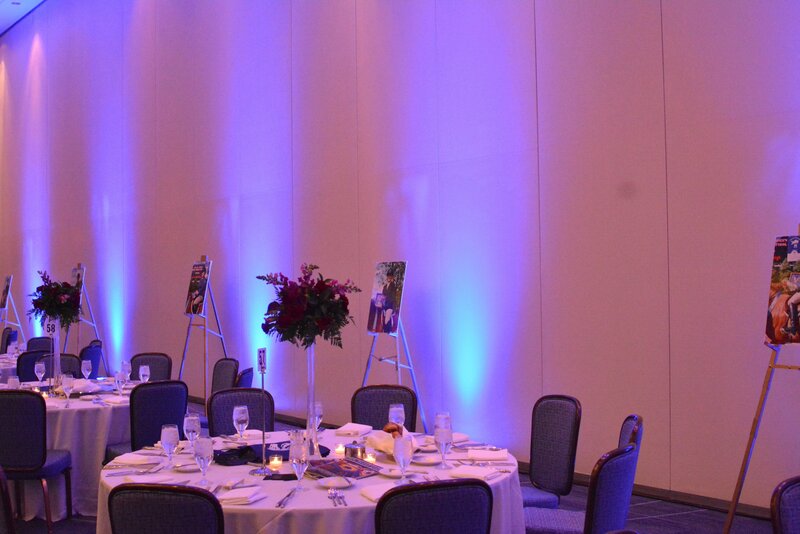 The sophisticated evening is planned and executed down to the very last detail, by IHJA, Patrick Boyle and the Showplace Productions’ staff. The grand event carries the Showplace Productions’ signature style with huge video screens displaying video clips of riders during the season and a play-by-play slideshow of the evening’s big winners. Super raffle and silent auction items including kid’s jumps, sports memorabilia and special horse show packages, kept patrons busy during the cocktail hour. 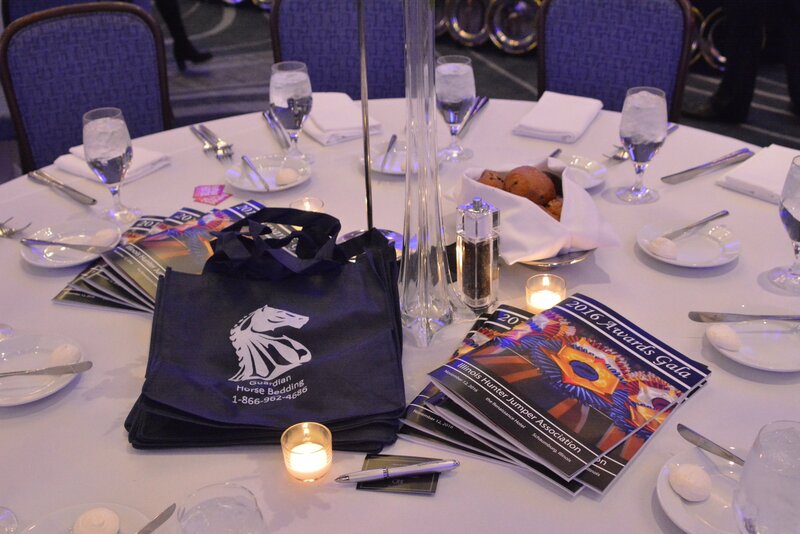 Spectacular ribbons, trophies and dancing topped off the evening, offering members a monumental celebration of the year’s accomplishments and a night to remember. The association awards ‘A’ and ‘B’ circuit championships for every division throughout the year along with special awards, including grand champions, sportsmanship awards and horseperson of the year. 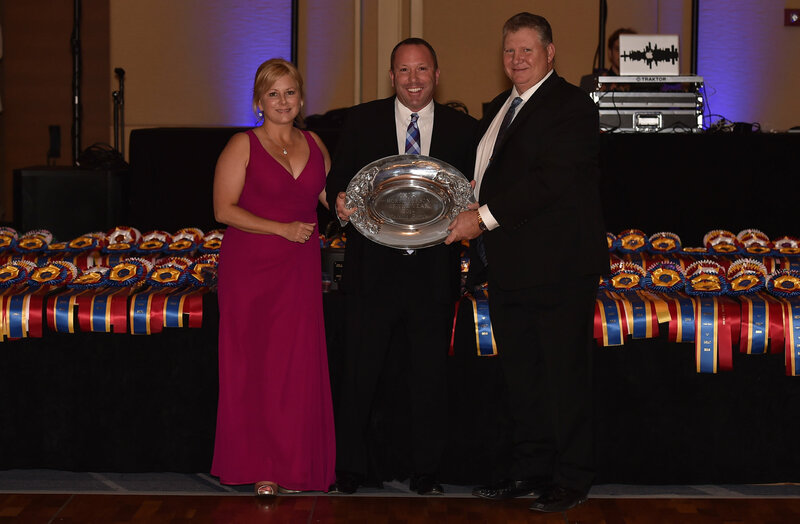 This year, the organization also had the distinct privilege to award the USHJA Vital Horse Show Staff of the Year Award. The award recognizes horse show staff members throughout the country, who demonstrate exemplary efforts and contributions to the horse shows. 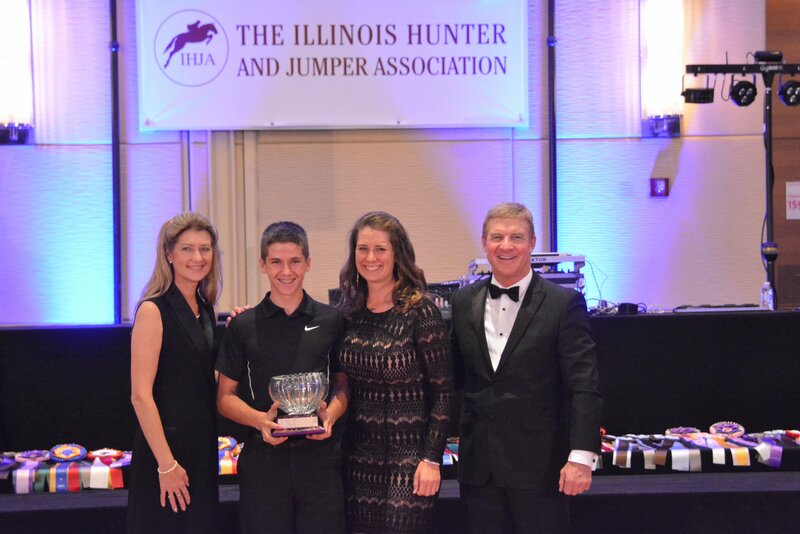 IHJA was honored to present the award to Michael Puffer for his outstanding efforts. 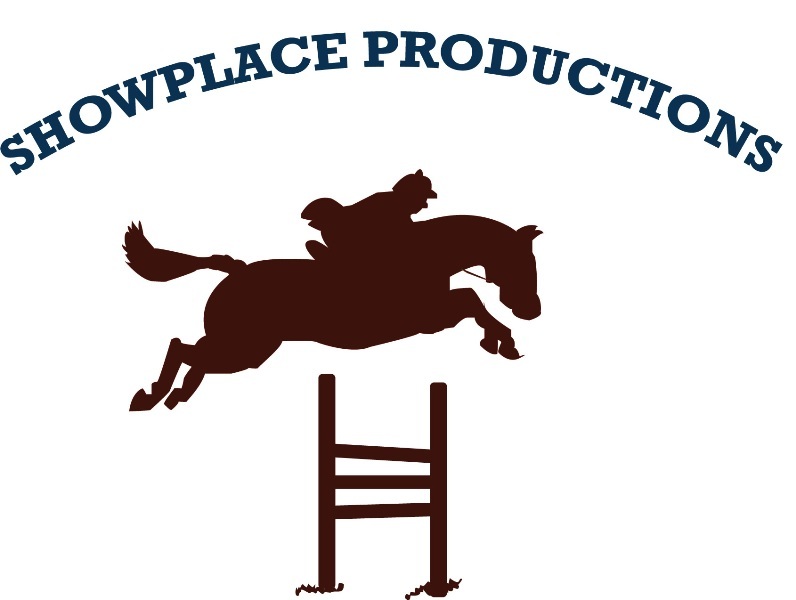 Puffer, 36, has worked for Showplace Productions for twenty-three years, handling every aspect of the horse show grounds from stabling and feed to course design and ring maintenance, proving time and time again, his importance to the Showplace Productions’ success. The award will also be presented to Puffer at the USHJA Annual Meeting in Palm Springs, during the Evening of Equestrian Awards Dinner on December 13th. 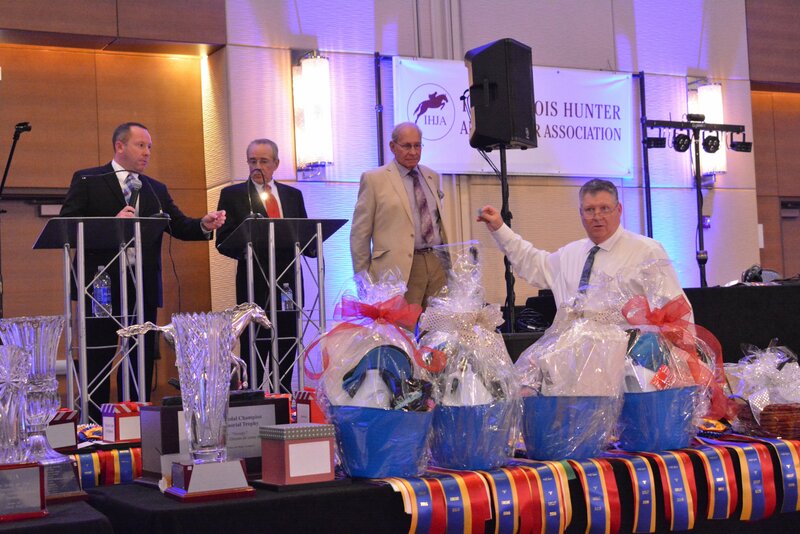 Ken Stien receives the IHJA Horseperson of the Year Award. Pictured (Left to right) Mark Boyle, Heide Casciaro, Ken Stien, Steve Foran, Patrick Boyle. Photo Chicago Equestrian. 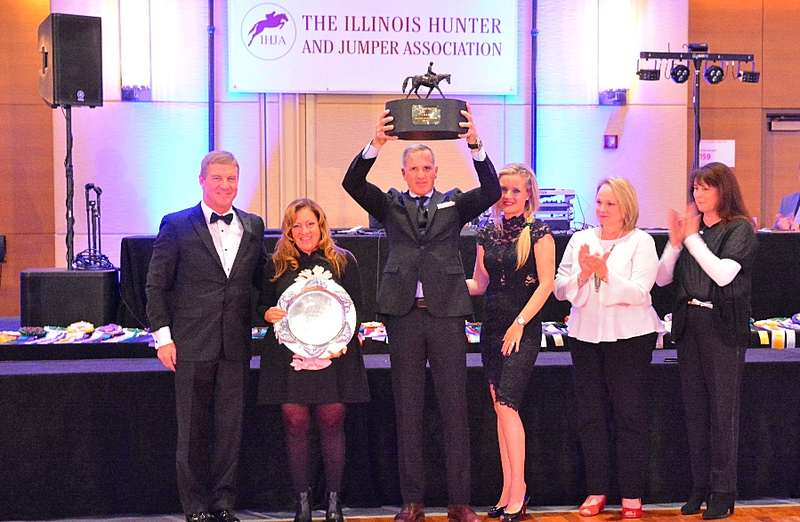 IHJA presented the 2016 Horseperson of the Year Award to Ken Stien. Stien is one of the founding fathers of Illinois horse industry and has been a member of the association for over 40 years. He selflessly gives his time as both a board member and banquet committee member, continuing to support the association each year. Stien is passionate about his teaching and even more passionate about his relationship with his customers and his peers. At 80 years old, he is still going strong and actively involved in the business at his Plantation Equestrian Center in Naperville and in the local association. Kyle Perkovich accepts the Life is a Journey Spirit Award with trainer Lisa Goldman. Photo Chicago Equestrian. The Life is a Journey Spirit Award, donated by David and Stacy Bell, is awarded to the person who demonstrates a lust for the sport and sets an example of that spirit to others. The 2016 winner was Kyle Perkovich, 15, of Long Grove, Illinois, who rides with Mary and Lisa Goldman at Red Coat Farm. Perkovich quickly moved up the ranks as a young rider from the pony division to earning the top spot on his mount, Roc My World, in the Marshall & Sterling $150,000 1.30m Series presented by Showplace Productions this year. His enthusiasm for the sport is evident and he is eager to learn more to continue moving up in the jumper ranks. Lauren Lackey received the Amateur Sportsmanship Award. Freddie and Jodi Vazquez and friends of Jill Vannatta presenting. Photo Chicago Equestrian. IHJA awarded the Amateur Sportsmanship Award to Lauren Lackey. 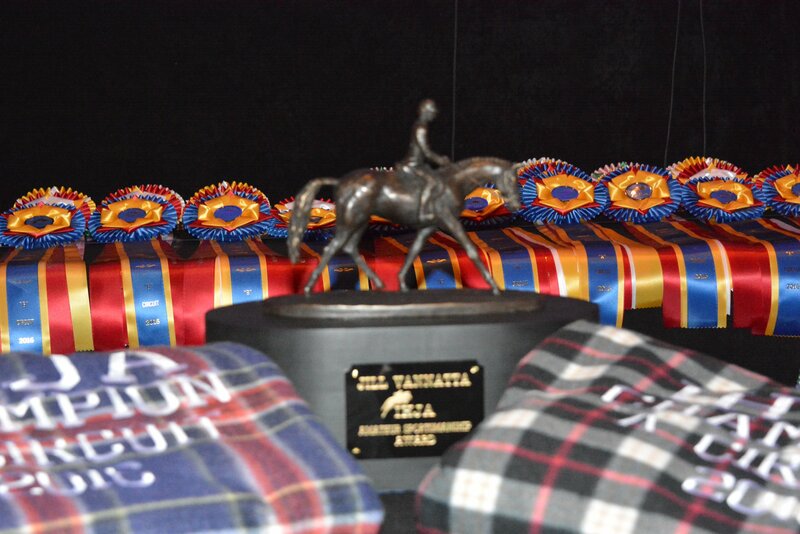 The award is in memory of amateur rider Jill Vannatta, who recently passed away but certainly left her legacy behind. Vannatta’s spirit and joy for the sport was always evident to those around her. She touched many lives as an amazing human being and will forever be remembered by those who knew her. Lackey displays the excitement Vannatta showed for the sport and was the perfect fit for the award. Lackey recently moved from the B circuit to compete on the A circuit in the Adult hunters with her horse, Providence, and rides with Scott Gentry. She is also a horse show mom to many, including her daughter Emma, while managing family, a job and her own riding. Britta Stoeckel receives the Junior Sportsmanship Award. Photo Chicago Equestrian. 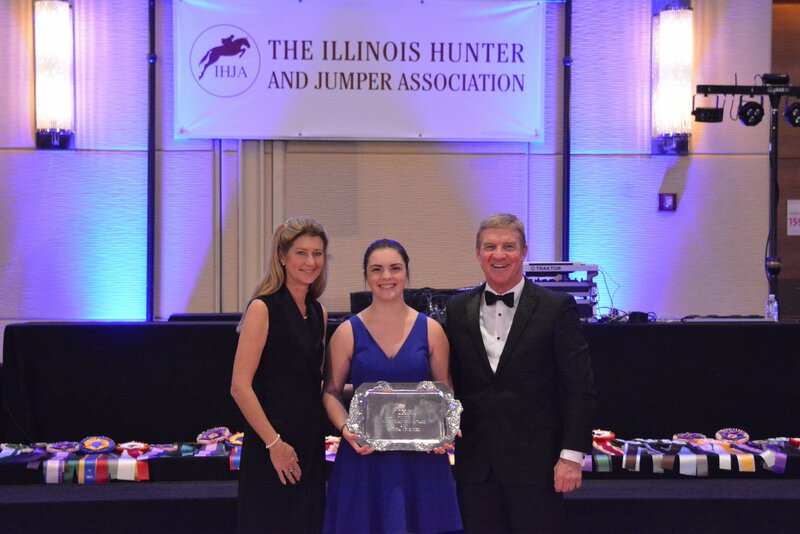 The 2016 Junior Sportsmanship Award went to Britta Stoeckel, who had a fantastic year with her horses including her first derby win in the $10,000 USHJA National Hunter Derby at the Minnesota Fall Horse Show. Stoeckel rides at Littlewood Farm and quickly moved from the pony division through the Children’s Hunters to the Junior Hunters. Win or lose, Stoeckel is admired for her eagerness to help others and to learn more about the sport. Denim Welhouse is the Rookie of the Year B Circuit. Photo Andrew Ryback Photography. One last special award went to the 2016 Rookie of the Year on the B Circuit. 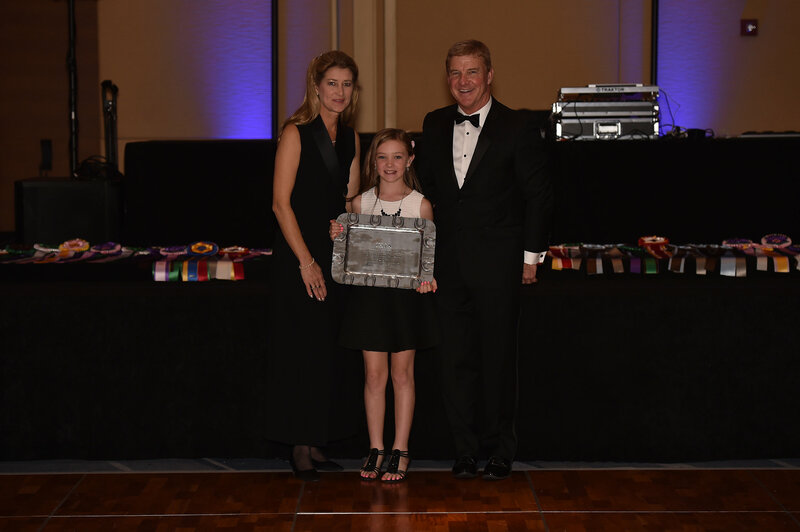 Ten-year-old Denim Welhouse earned the award for her success in the ring this year. The young rider also participates on the Quarter Horse circuit but under the guidance of Kim Gardiner and Mara Olseng from Perfecta Farm, she has become a rising star as a newcomer in the hunter/jumper world. Master of Ceremonies Michael Puffer and Robert Devore assist Ken Stien and Patrick Boyle with raffle winners. Photo Chicago Equestrian. After the awards and a delicious meal, the celebration carried on with dancing and socializing. 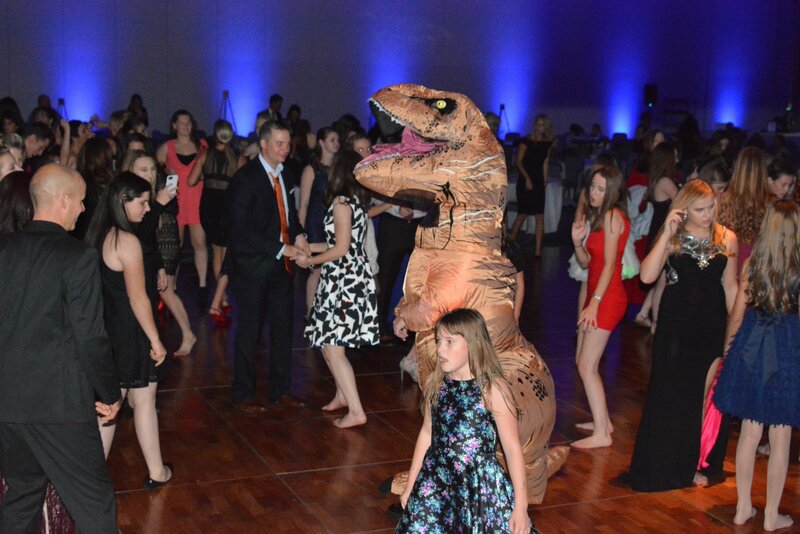 Kids, adults and even a dinosaur took to the dance floor after getting their championship photos taken by Andrew Ryback Photography. 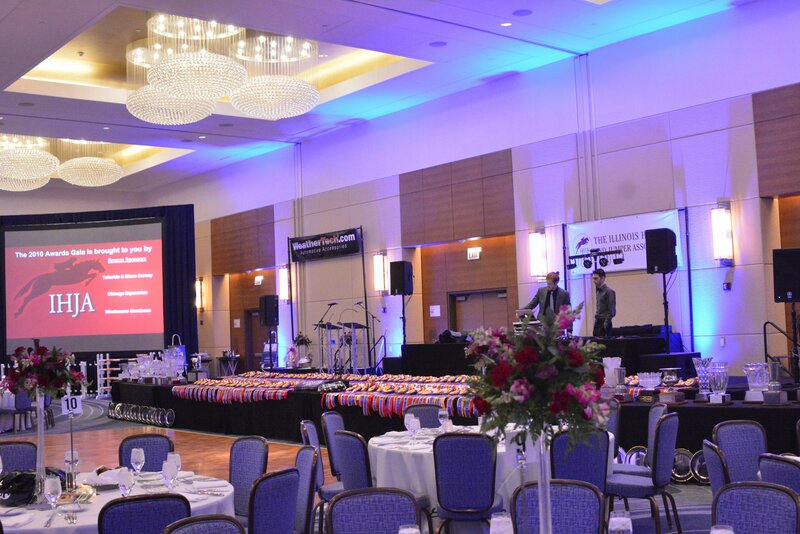 The evening wouldn’t be complete without the famous Chicago Cubs W flag flying on the dance floor as well. HITS Balmoral Park Video and horse show video for the evening entertainment was supplied by Star Creek Video, video screens were sponsored by Clay and Donna Struve, entertainment was sponsored by EQUO, the light show was produced by Weathertech and David MacNeil and the kids bar was sponsored by the Stoeckel and Markman Families. 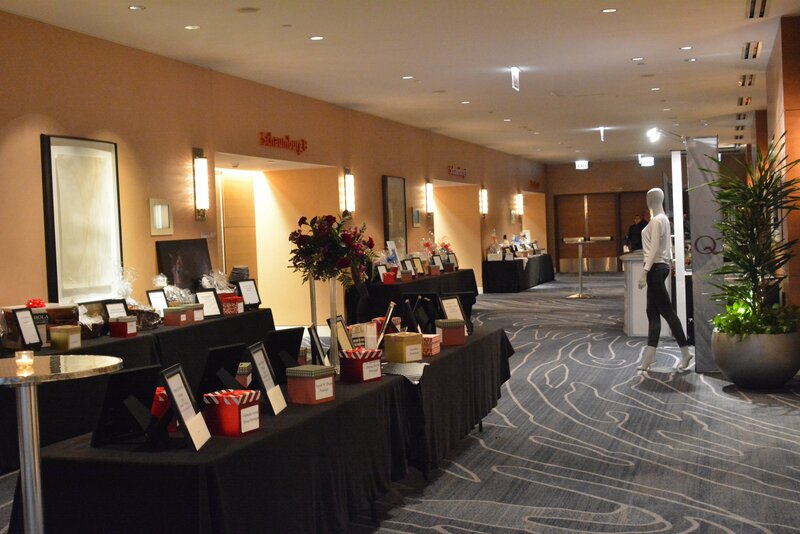 Party goers could browse the raffle items during cocktail hour. Photo Chicago Equestrian. The cocktail hour hors d’oeuvres were sponsored by Pat and Nicole Boyle, Matt and Holly Yeterian (True North Farm) and Troy and Laura Linback (Woodrun Farm). 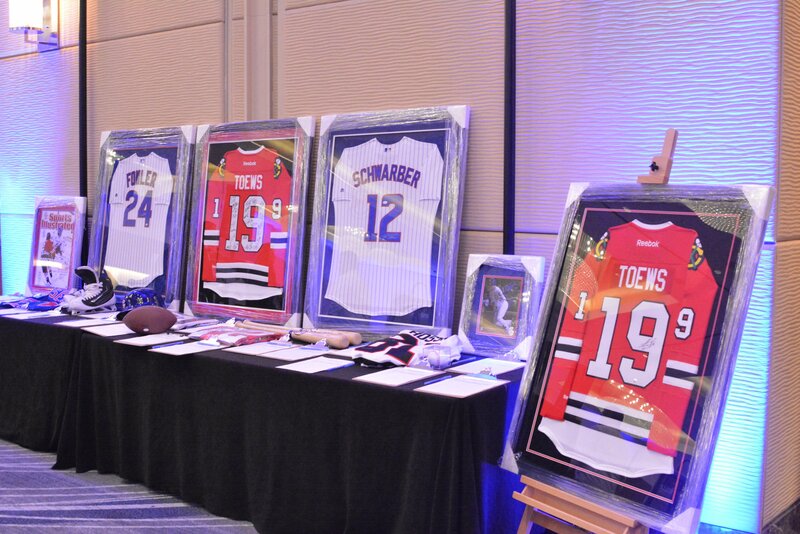 Special thanks goes to the numerous raffle and silent auction item sponsors and donations. 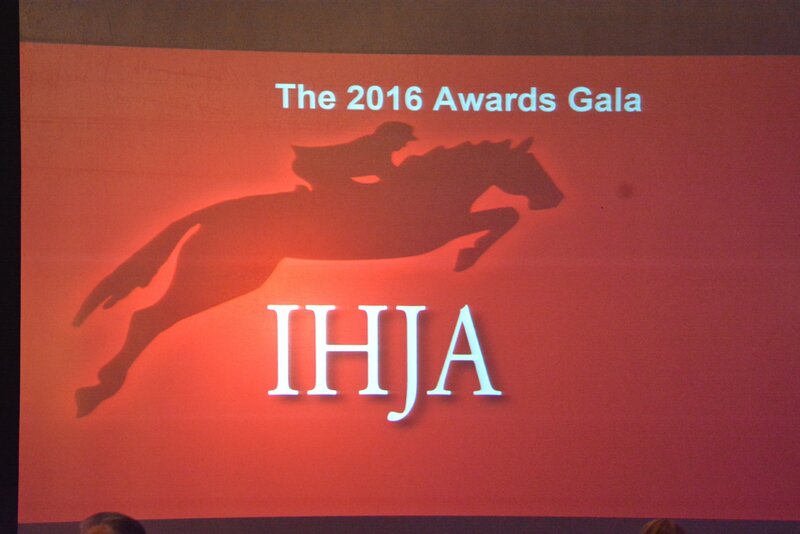 To join IHJA, visit their website at www. IHJA.com or ask for a membership form at any IHJA horse show. 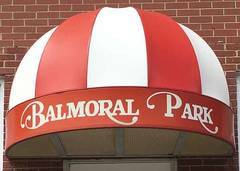 For a 2017 show schedule of Showplace Productions and HITS Balmoral Park events, visit their website at www.ShowplaceProductions.com or www.hitsshows.com/balmoral-park.